The joining of two households brought together the need for a secluded guest room which lead to the creation of an heirloom guest bedroom, in bed and breakfast style for this Portsmouth, New Hampshire coastal bungalow which sits on the waterfront of the Piscataqua River. The owner’s passion for design, architecture and vintage finds they wanted this space to be a warm and inviting room full of interesting items and family memorabilia. A cozy reading area was created with a vintage French Provincial button tufted orange velvet chair purchased in Manhattan, with antique white finish and gold accent details. Fresh flowers are always present in the guest bedroom from the homes gardens. 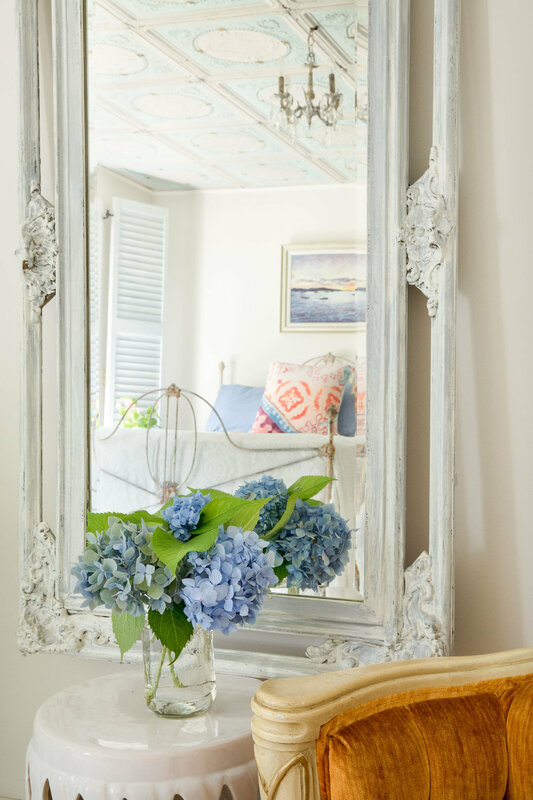 Hydrangea cut from hydrangea alley, fresh fruit, fragrant guest soaps, a basket of collected shells and driftwood shore finds add comfort and charm in this guest room retreat. The grandmother’s writing desk which was passed on, was originally painted in olive green. Dry brushing technique was applied to the desk to give a distressed lighter feel that would fit in the room. A marble clock was another passed on piece accents the desk. Above the desk is a set of old photographs of Gloucester and Rockport, Massachusetts. 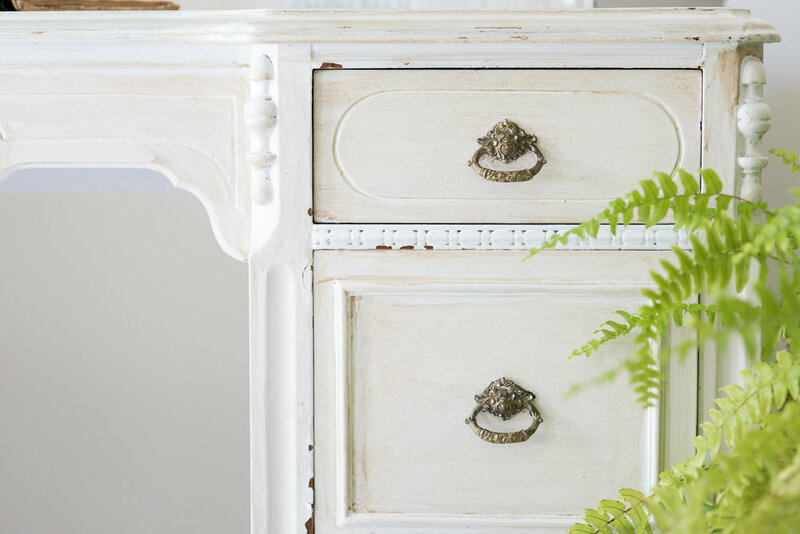 A grandmother’s mirror also hangs proudly above the hand painted dresser of which was also distressed and embellished with detailed brass hand-pulls. A rusted iron side table, another vintage find was painted in off-white and left without a tablecloth to give a more spacious look to the room. Closet door pulls were replaced with a combination of bronze and glass to add a little charm to the existing closet doors that received a fresh coat of white paint. For privacy, exterior vintage shutters were found and added to the inside of the windows. These would allow for a fantastic view of the cove and gardens for guests to enjoy when open and provide privacy when closed at night. Ceiling: Blue and white tin ceiling tiles were salvaged from an old Greek church in Biddeford, Maine that was being torn down to put up a parking lot. Wood Floor: Whitewash pickle finish in poplar wood. 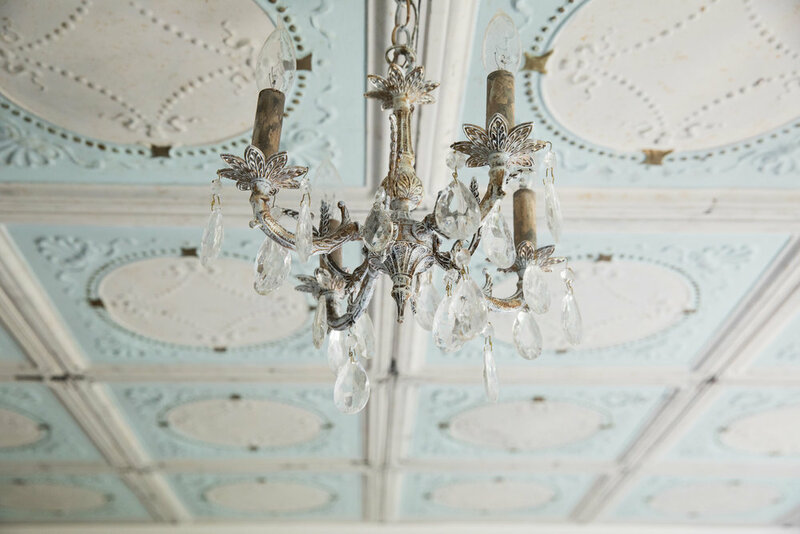 Lighting: Antique crystal and brass mini chandelier. 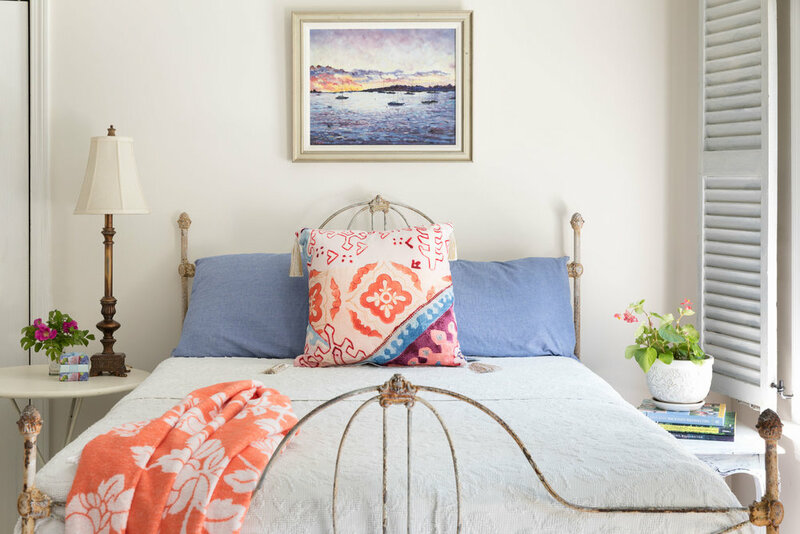 Oil Painting: The inspiration for color in the guest room came from a painting of Chebeague Island, located in Casco Bay Maine and 10 miles from Portland. Jean Byrd, a well know Rockport and Camden artist whose concentration is New England coastal scenery. The purples and blues along with the orange-yellow paint colors inspired accents in the guest bedroom. Vintage Iron Bed: Flukes, Friends and Finds in Newburyport. The perfect fit for this soon to be nostalgic retreat. An heirloom Martha Washington bedspread from the late 60’s, a bit worn but still loved, was used to dress the bed.